Involves daily personal study and weekly group discussion of homework, using a study guide and video teaching by various Christian authors such as Beth Moore, Kay Arthur, Priscilla Shirer and more; designed to help women know the Bible and discover how to apply it in daily life. Held in November to honor our service men and women. Each birth and new marriage is honored with a shower to honor the occasion. 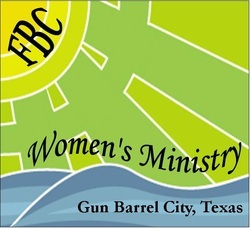 Click here to contact FBCGBC Women's Ministry.